Did you know that the submission period for the 2015 Audies is open? Sponsored by the APA, the Audies recognize distinction in audiobooks and spoken-word entertainment. As a publisher or producer of an audiobook, you can enter your ACX title for consideration as a nominee, and yes, rights holders, by “publishers,” we mean you! Titles released between November 1, 2013 and July 31, 2014 are eligible during the current submission period. Submission runs $175 per title ($100 for APA members), and must be completed by August 22. Complete submission info can be found here (PDF). Submit your ACX production today, and you might find yourself the winner of a shiny new Audie! Now, on to your weekly links roundup. J. R. R. Tolkien’s 10 Tips For Writers (Infographic) – via Galleycat – Take a look at the Lord of the Rings author’s advice for wordsmiths. The Joy of Writing Longhand – via Lit Reactor – Writing longhand: antiquated idea or inspiring throwback? 10 Essential Tips for Dating A Writer – via Buzzfeed Books -Check out this fun look at what it takes to date a writer. Do you resemble these remarks? This Much I Know…10 Things I Learned From Getting Into Voiceover – via steveoneillvoice – Steve O’Neill helps you learn from his time in the VO business. What Growing Grass Taught Me About Voice Over – via Marc Scott Voice 0ver – Find out why the voiceover business is all about patience, perseverance, and endurance. As we enter the final weeks of 2013, listmakers near and far are weighing in on the “Best of 2013”. Whether you’re looking for inspiration while writing or recording, in need of a break from hours of creative work, or just looking for your next great listen, you’ll find something to love in our roundup of the Best of The Best of 2013. Audible’s Best of 2013: Check out the best listens in every category from Audible’s editors, as well as listener favorites. The Washington Post‘s Best Audiobooks of 2013: TWP offers their top listens of 2013, all of which are available on Audible! The Audies – 2013: The Audio Publisher’s Association named their top books of the year, and 4 titles produced on ACX took home awards (Swordspoint, The Privledge of The Sword, Anita, and The Personal MBA)! The NY Times Ten Best Books of 2013: The Grey Lady offers top picks in fiction and nonfiction, all of which make great listens. The Audiophiles’ Best Audiobook Listens of 2013: BookRiot has a fun take on the written and spoken word in their list is full of unique recommendations. Goodreads Best Books of 2013: THE place to discuss books discusses their favorites of the year. Publisher’s Weekly – Audiobook Bestsellers: Publisher’s Weekly lists their top ten audiobooks as we near year’s end. NPR’s Book Concierge – Best of 2013: Another great list of the top reads from 2013, with links to in-depth reviews of each. Now that you’ve got a feel for the best written and spoken words of 2013, think about how you can apply what you’ve learned to your writing and recording in 2014. What trends did you notice this year? What genres topped everyone’s list? Take good notes, share them below, and let them lead you into a productive and successful 2014! Last week was a fun and exciting one for the audiobook industry, especially here at Audible/ACX . We loved meeting so many current and future ACXers at BookExpo America (BEA), The Audies, and our in-house Narrator Knowledge Exchange, and we can’t wait to share some of the good times. ACX Production Coordinator Charles Clerke gives ACX Knowledge Exchange attendees a walk-through of the site. Kicking off our busy week, ACX and Audible Studios hosted 55 fabulous voice actors, studio pros and producers at the Audible offices Thursday, May 30th. Jason Ojalvo, Audible Vice President and head of ACX opened the day with an update on the burgeoning audiobook market and the many opportunities available through Audible Studios and ACX. Guests then enjoyed sessions from Audible staff members on home studio setup, self-recording, editing and mastering. A lucky few were randomly selected to audition for Audible Studios, while others enjoyed tours of our offices and brand new solo recording booths. We love meeting audiobook professionals of all stripes in person, especially ACX members, so keep an eye out for additional opportunities like this in the future. 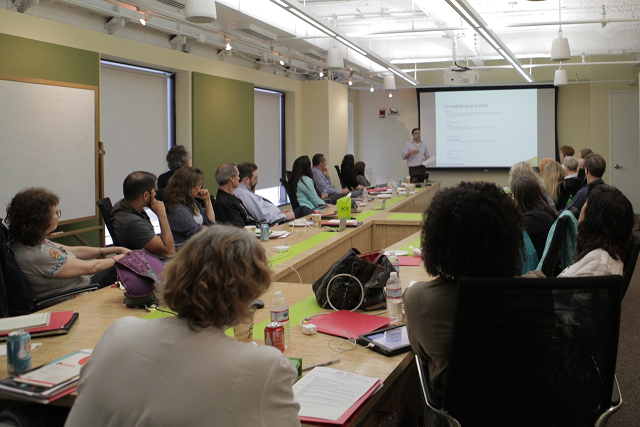 Click here for more photos from the ACX Narrator Knowledge Exchange. Members of the ACX team demonstrate the many ways to enjoy listening to an audiobook. Thursday was also the opening day of BEA, and ACX participated with our first-ever booth. Our team spread the gospel of ACX to authors, agents, and publishers over the three day show, and many had excerpts of their titles read live by ACX narrators at our in-booth recording “studio.” We’re looking forward to the outstanding new titles that this outreach will bring to ACX in the coming months! 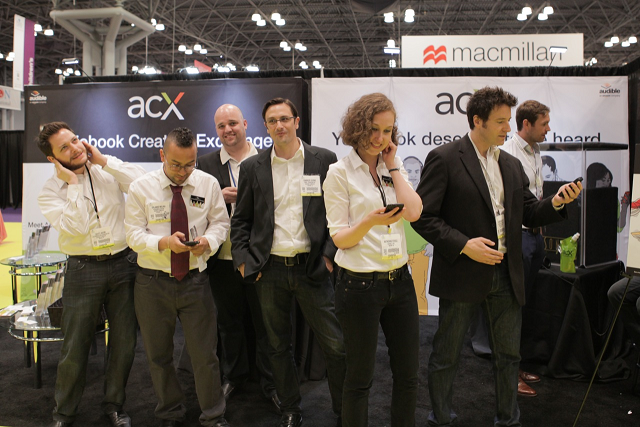 Click here for more photos of ACX at BEA. 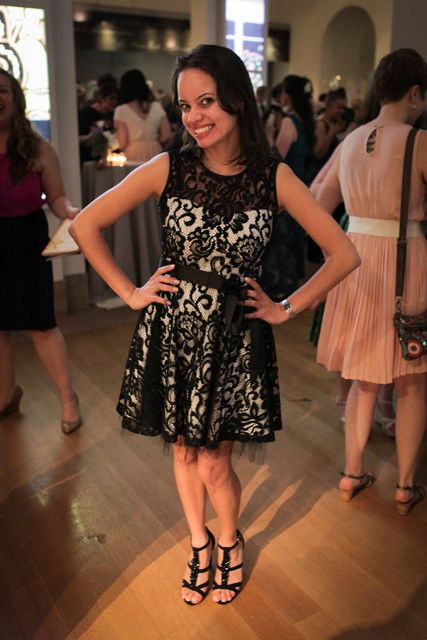 ACX’s own Nicole shows off her dress at the 2013 Audie’s. We now turn our attention to the second half of 2013, and all the exciting ways we have planned to grow and improve the ACX experience for all of our users. If you were a part of our wonderful, crazy week, tell us your memories in the comments!